4 bed apartment - 2018/19 £99 per week! Reserve Early to ensure your group does not miss out! Queensland Place is an exciting new apartment complex located in the heart of the cities student community. It contains 407 en-suite rooms, of which there are 25 studio apartments and 73 cluster units each housing 4-7 bedrooms along with communal areas and kitchen facilities. As well as high-quality accommodation, the development also contains a large games room/reception area, cinema room, a launderette and an on-site gym. This purpose built accommodation block is ideally situated for students who want to be close to their Universities, shopping facilities and popular student restaurants and bars. 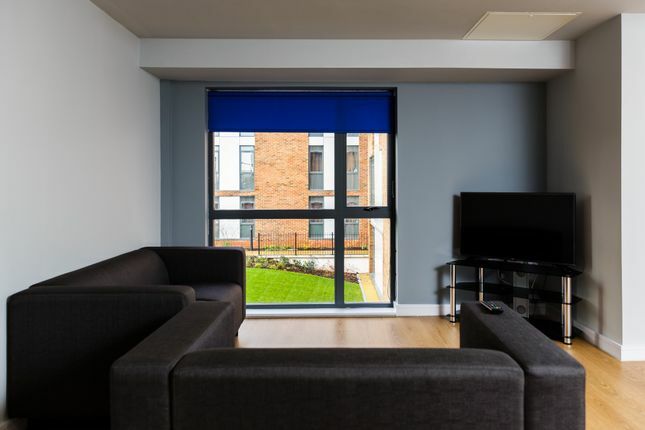 Located on Queensland Street in Wavertree, the development is perfectly situated for students at the University of Liverpool. A two-minute walk down the hill will bring you into Abercrombie Square. Property descriptions and related information displayed on this page, with the exclusion of Running Costs data, are marketing materials provided by LIVERPOOL CITY RENTS, and do not constitute property particulars. Please contact LIVERPOOL CITY RENTS for full details and further information. The Running Costs data displayed on this page are provided by PrimeLocation to give an indication of potential running costs based on various data sources. PrimeLocation does not warrant or accept any responsibility for the accuracy or completeness of the property descriptions, related information or Running Costs data provided here.